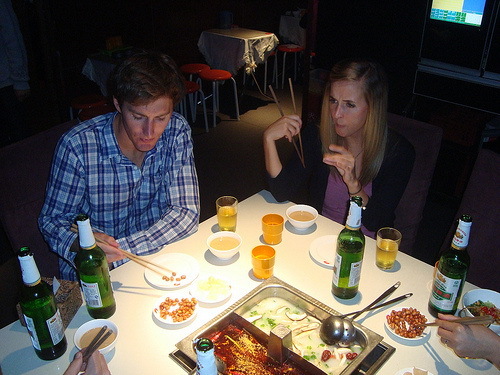 China’s version of fondue, hot pot experiences are meant to be shared with a good group of friends. 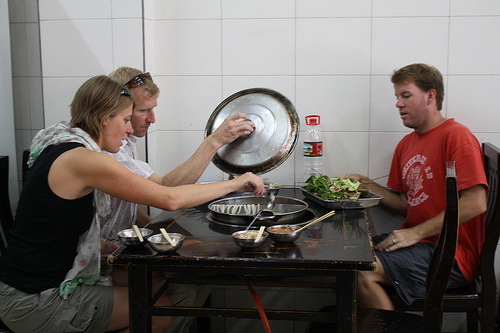 It works like this; in the middle of the table is a hole where a “hot pot” of boiling water and oil sits. If you are really lucky or in the know, your hot pot restaurant will come with its very own “noodle ninja.” This samurai noodle-maker will take a ball of dough and knead and stretch the dough into sinewy-thin noodles. Like a raver at an Ibiza nightclub, the noodleman will chuck his edible glowsticks into the boiling pot for you to enjoy with the rest of your meal (check out the video here if you need a visual explanation).